Absa Group Ltd., South Africa’s largest retail lender, and FirstRand Ltd., the nation’s second- largest financial services company, were rated “overweight” in new coverage at RMB Morgan Stanley. Nedbank Group Ltd., controlled by Old Mutual Plc, had coverage initiated at “underweight” with a price estimate of 139 rand a share, while Standard Bank Group Ltd., the continent’s biggest bank, was rated “equal-weight” with a price estimate of 114 rand. Absa’s price estimate was 167 rand, while FirstRand’s was 22.65 rand. Standard Bank surged the most since Jan. 3, adding 1.9 percent to 106 rand by 1:29 p.m. in Johannesburg. 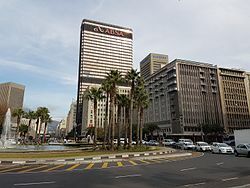 Absa snapped two days of losses, rising 0.7 percent to 138.44 rand, while FirstRand climbed 0.5 percent to 20.05 rand. Nedbank increased 0.3 percent to 131.95 rand.